This ornamental perennial is perfect for the shade garden. It has leaves that persist all year. 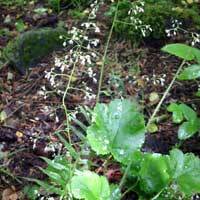 When blooming, the tiny white flowers form a mist of flowers that brighten any woodland garden.